Many organizations are dealing with a growing number of VPCs which poses new challenges and complexity for network connectivity, security and operational management. 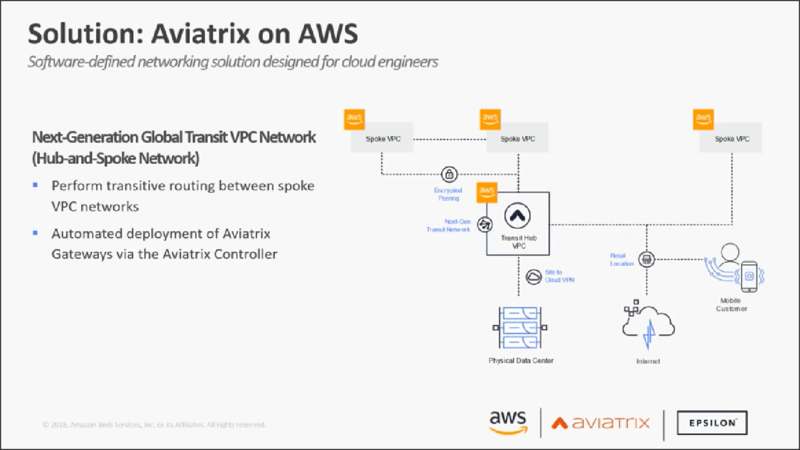 Aviatrix for AWS is a software-defined networking solution that enables anyone to rapidly automate and secure connectivity between spoke virtual private clouds (VPCs) and their on-premises resources. Register for our webinar to learn why Epsilon leveraged Aviatrix to switch from a vRouter-based global transit to a next-generation transit hub, streamlining resource provisioning and security implementation in their hybrid network. We’ll also discuss best practices for scaling and securing connectivity for your Amazon VPCs, while achieving compliance and reducing costs. Those responsible for planning and implementing connectivity between AWS VPCs and on premises resources, or VPC to VPC connectivity, including cloud architects, cloud engineers, cloud infrastructure managers, DevOps, and networking staff.